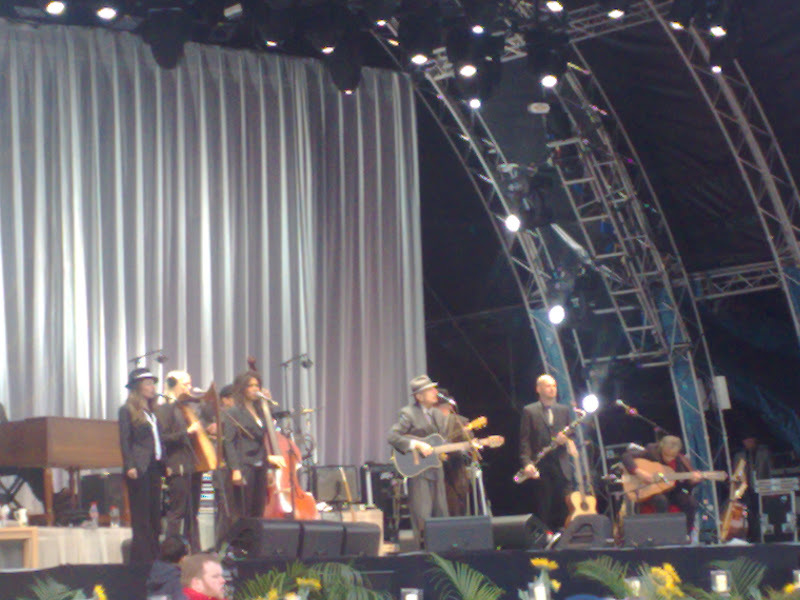 Went to see Leonard Cohen on Sunday at the Royal Hospital Kilmainham. This was an unusual gig on a number of levels. The RHK is not used that often for a gig, but its a great venue. Very accessible, we were able to get a taxi almost to the gate and then it was only a 30 minute walk home afterwards, and with good acoustics - perhaps the best sounding outdoor gig I've been to in Ireland. The weather was appalling, as usual, with torrential downpours throughout the show (an all-seated event - seriously, why do we even bother having outdoor gigs in this country? ), but even this didn't dampen the enthusiasm of the crowd (well, not that much anyway). The crowd themselves were not the usual gig gowers, owing to the length of Mr Cohen's career, and it would not be an understatement to say we were amongst the youngest people at the gig, which was nice. The audience demographic led to some unusual features of the gig, from roving cappuccino sellers with vats of coffee strapped to their back, to gourmet pie, sushi and thai food stalls and nary a burger van in sight. The queues for beer were non-existent, but minor scuffles broke out at the wine tents, and by 10pm you couldn't get a snifter of champagne for love nor money. And you haven't lived until you've watched the hilarious antics of a 50-something year old lady-who-lunches trying to negotiate her way to the portaloo over grass in high heels after one too many snifters. In fact, the best drink awareness campaign the government could run would be to bring a bunch of kids to something like this and show them what drunk old people look like. It is a sobering experience, on par with watching your relatives sing and dance after midnight at a family wedding, only in public, in front of strangers, wearing tweed jackets over their Leonard Cohen tour t-shirts. As for the man himself, simply amazing. In his 70's and forced back on tour after his manager embezzled all of his money leaving him practically destitute in 2005, and after playing for two previous nights already, the man was simply incredible. His voice was a strong (or as horse) as ever, and he sang for almost a three hour set. Although I'm not the hugest fan in the world (unlike the Very Understanding Girlfriend, the reason I went along to the gig), I was amazed by the fact that I knew almost every song he sang, playing two full sets and three encores. On top of this, he paused on a number of occasions throughout the night to recite some of his poetry, a deeply moving experience. There was also the sense that this was a once in a lifetime event, he hasn't played in Ireland for more than twenty years, and it is highly unlikely that he will play here again. To see the man perform with such power and passion is something that I will not soon forget.